Step-by-step instruction on how to make your very own Vortex Light/Lamp. A DIY light / lamp that will look super-cool on your desktop, living room or as a night light. I'm quite sure however, that it will not strike terror in anyone. This is a simple project that costs me RM 25, and a day to complete. Caution: Image heavy page, may take time to fully load. Another thing, I'm currently stuck with a pathetically useless camera. So please don't scratch your eyes looking at (some of) the poor quality video (and photos). Similar to how a magnetic stirrer works, a motor will spin a permanent magnet on the Y-axis creating a spinning magnetic field. Placing a ferromagnetic metal within that field will cause it to spin as well, without making any physical contact with the magnet and motor. The spinning motion of the metal will stir the water in the glass, creating a twister/vortex. Once we have the vortex, it's just a matter of illuminating it. After experimenting with several placements of the illumination source (top, bottom and all around). It turns out that narrow vertical illumination from the sides (90 degrees, perpendicular to the vortex) yield the best result. It accentuates the vortex and produces the most dramatic effect. 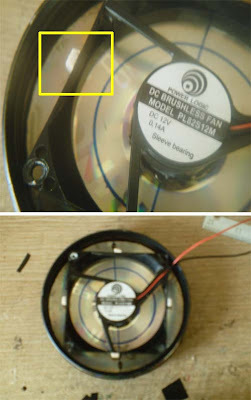 1) 80mm, 12V DC computer case fan. Apart from it's voltage which match the voltage source I plan to use, there is no specific reason for choosing the 80mm fan. It's just something I have laying around the house. If you ought to buy it, any surplus computer store will have one for less than RM 5. 2) Universal AC-DC power adapter (1.5V-12V, 500mA). You can get it any electrical store. I got mine a while back from my neighborhood store for (if I'm not mistaken) RM15. 3) Standard Red LED (voltage range 1.7V - 2.2V). I just think red gives out a good "terror" vibe. No, really, you can use green, blue, yellow or whatever color you please. Just be sure to check their voltage and current rating if you're planning to them from an adapter like mine. If you're not into soldering and such, and have a lot of money to spare, a better choice would be those cold cathode lights, you can get a much brighter and more even illumination. 4) Neodymium Iron Boron (NIB) magnet. Any kind of magnet won't do, especially those ferrite fridge magnets. It has be a neodymium magnet for it to work. Or at least the old school samarium cobalt magnet (if you can find one). I got mine from a dead hard drive. Other source of these magnets would be those magnet therapy bracelets (though the pricing is an utter rip-off). If not, you're going to have to shop online as neodymium can't really be purchased off the shelf (at least in this part of the world). Please note that although it is tempting to purchase neodymium of the highest strength (i.e grade N50), the higher the grade the more susceptible it is to demagnetization by heat. The hard drive magnets are generally of medium strength which makes it perfect for operation in hot hard drive environment and in our case, hot motors. Yes, you can use a bong if you have one. I use a tall drinking glass. The thickness of the bottom of the glass is very important. If it's thick, then the magnetic field that reaches the stirrer will be too weak. If you're stuck with a thick bottomed glass, put a lid on it and use it upside down. 6) All the stuff below are optional. They depends on the how you want your light to look like, what junk stuff you have around the house and how much money you're willing to spend for this project. Black diamond CD-R - I like the black mirror surface. They will be used as the base. DVD Case - Will be used to make the fins. It's black, matte, easily cut and shaped. PTFE tape - To make the glass lid water tight. Cryanoacrylate adhesive - That's Super Glue (aka Gam Gajah). Get the less viscous type normally sold in eye-drop shaped bottles. Balsa - Cutout from 5mm thick sheet. Used as spacers. Clear transparencies - Layered with semi transparent double side tape for LED light diffusion. Hot glue gun - I'm proud of my trusty glue gun, which I bought for RM 2 (that's USD 0.62), thank god for China. Cut-off all the fan blades with a knife leaving just the core. Do note that in the next picture, I used a hacked ATX bench power unit instead of the adapter for testing. In your case, you can cut off the the connectors from the adapter, strip the wires, tie them straight to the fan. Using the double sided foam tape, stick your magnet firmly in the center (pictured below). Since a hard drive magnet is oddly shaped, this can be tricky. Turn the fan on. If it starts to vibrate violently, it means the magnet is off-center, peel it off and stick it again. Repeat until you hit the sweet spot which yields no or the least vibration. Secure the magnet with hot glue. Dab it quickly because we don't want the heat to demagnetize the magnet. the lookout for violent vibrations. 4. Getting The (Perfect) Vortex. Cut the straight portion of a paper clip. Bend it into the shape below. Coat it with thin layer of rubber glue to prevent it from rusting. Drop it into the tall glass filled with clean water. Layer the glass opening with PTFE tape, close the lid and turn it upside down. Tuning the vortex. This will take several attempts. paper box is not part of the rig. The length of the paperclip stirrer - experiment with shorter and longer stirrer. 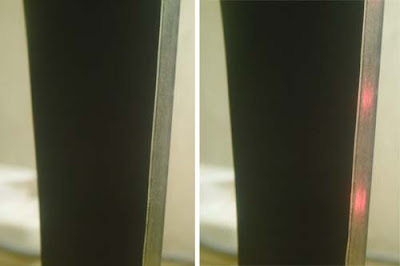 Air gap - the gap between the magnet and stirrer. Reduce or increase the air gap as necessary. 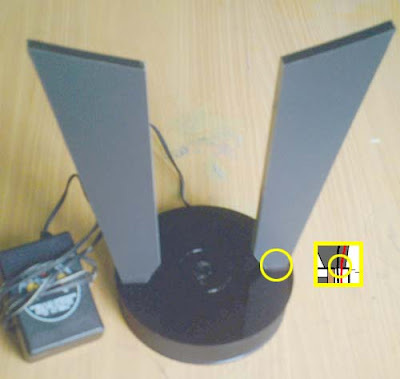 The speed of the fan - of course with a constant voltage/current supply, the speed will be constant. The water level - adjustable. I'm pretty sure there's a mathematical formula in there somewhere, but the bottom-line is tweak (1), (2) and (5) until you to get the perfect vortex. Hence the use of Plasticine for support, so we can easily adjust the air gap. 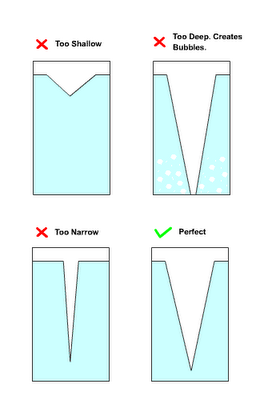 Once you're happy with the vortex, save the stirrer, take the measurement of the air gap and the water level. Another reason why the vortex shouldn't be touching the bottom is it produces an unpleasant sound, similar to the slurping sound of a draining sink or bathtub. The spinning stirrer also produces some friction noise, so pick the lid material correctly. A glass will produce almost no noise; a solid smooth plastic lid, minimal noise. I layer the lid with rubber electrical tape to reduce the noise further. the fan when finally enclosed will be very quite. So, with proper layering and enclosing, the rig will produce an almost inaudible sound. 6. The Rest Of The Build. The rest is pretty straightforward. The diagram below pretty much explains everything. The full diagram of the Vortex Light. The fins will house the LED, while limiting the light into a narrow vertical beam. The beam, being perpendicular to the vortex produces the best effect compared to other placements. That said, I was also going for a (somewhat) sinister look. Hence (if you recall) the resemblance to The Riddler's Mind-Reader thingamajig in Batman Forever. Cut out the sheets from old DVD case. The dimension depends on your own creativity and the rest of the items you used in your rig. Layer both side of the sheet with double sided foam tape. Stick the LED. Once your happy with the placement, solder all 6 of them together. Add the spacers to hold the shape together when we sandwich the LED (not in picture). If you're using a 5mm sized LED, the spacer should be around 6mm thick. Sandwich the LED between the two sheets (pictured below). Front view of the fin. Attach the the two sheet together, and test the it out. Note where the wires are coming out of the fin. Add the light diffuser on the fin's opening. It is made of clear transparency plastics layered with semi transparent tape. Secure it, and we're done here. The fin with the light diffuser. Remember the the air gap measurement we took earlier when tuning the vortex? Create the spacer for the fan creating the same EXACT air gap. Secure the spacers to the floor with hot glue. 4 spacers on four sides of the fan. 9. Putting It All Together (And Wiring Them Up). 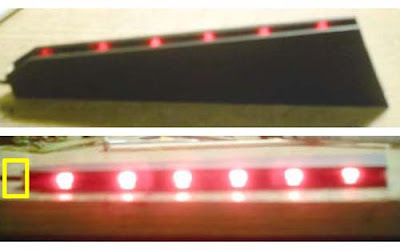 Drill a hole on the base floor for the LED wires to run through (pictured below). You will also need to drill a hole for the power adapter wire (not in picture). Attach the fin to the base with the wire running through the holes we have created. Of course we can't see the wires once the fins are attached. The picture below show where it supposed to be. Also note the adapter wire coming in through the back in to the base. The fin attached to the base. The wires run through the inside. The adapter supplies 12v 500mA, and the fan draws 140mA at 12V. The 12V is also within range to operate 6 Red LED (on each fin) in series safely at 2V each. So I wired the circuit as below. The power source, 12V 500mA. Secure the wiring, add the finishing touches, place the glass on the base. You can either permanently secure it on the base with glue or just simply placing it on the base. For me, I would want the option to change the water every once in a while. Plus the whole thing is a lot easier to carry around separately. But, if you want to it to be permanently secured to the base, be sure to sterilize the water and the glass you're using, and seal it tightly. And remember also to coat the stirrer to (see step 4). You don't want the water to turn grey (or orange) after a few weeks. I had mine for 3 weeks now, it works fine, and the water is still crystal clear. Give yourself a pat on the back, have a smoke cookie, and impress your geek girlfriend/friends/neighbor with your Vortex Light / Lamp. Where do you get your LED's from? Any particular type of shop? If you have 12 leds (1.7-22 V) they will take at least 20.4 V an then a vent (12 V) it will take 32.4 to power it up, right?`how can a power adapter at 1.5-12 V power that up? It will take 32.4V if all the LEDs and the fan is connected in series which is NOT the case with the circuit above. The circuit above is a combination of series parallel circuit. The Fan, LED 1-6, and LED 7-12 run parallel. Thus the fan get 12v, LED 1-6 get 12V, LED 7-12 get 12v. Using the same power supply, you can still add more LEDs ie LED 8-13, and LED 14-19 and so on until the current adds up to 500mA. sir good day.. the magnets attracts to the fan right away..no need to stick it up..is that ok? in your case why would you stick the magnet in your fan? The only reason is to secure the magnet in place. This is to avoid it from skidding / flying off as the fan spins at high speed.